We are working with very experienced real estate investors some with over 20 years of experience in the real estate field. These Real Estate Investors are private individuals that just want to help others using their expertise and access to cash. We are interested in helping you to improve your situation! Stress can kill! We want to eliminate any stress associated with real estate by helping you as quickly as possible. We have bought houses and properties in every area nationwide and in every condition imaginable. In order to be affiliated with the service on this website, all real estate investors must pass a rigorous qualification process, including verifying their ability to pay CASH for properties and to do so very FAST. Our website is secured and the information you provide will only be known by qualified professional investors who will help you buy paying cash for your house. Fill out the Real Estate Listing form. Only qualified professional real estate investors will contact you. You will work directly with the real estate investor to finalize the deal. There are no third parties and no commissions to pay. The real estate investors have signed a contract legally binding them to keep your information strictly confidential. Who Is Qualified To Use Our Service? 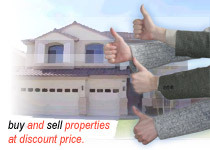 In order to qualify, you be in a situation in which you want to sell your house quickly. To sell quickly you must be willing to sell at a discount. By discount we mean that if your house needs anything done to it (i.e., paint, carpet, tile, roofing, plumbing, central heat and air, or other repairs), then your asking price of the house plus repairs and improvements must add up to less than 80% of the fair market value. LIST YOUR REAL ESTATE/PROPERTY LISTING NOW! You are not alone there are millions of houses that go into foreclosure every year. In your state alone there are 100s of thousands in foreclosure right now.